This is a portable surface roughness gauge capable of being carried from sample-to-sample for batch work, one-off or higher production runs. Readings are activated by push button and take less then 1 second. The unit is equipped with a LCD display and memory capable of storing 10,000 readings. 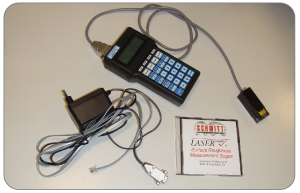 Data can be downloaded and firmware upgraded via the optional software and RS232 interface. The Model B control can be used in conjunction with the 8826 or 6212 measuring heads and is powered by 6 standard AA batteries.